MK Dons won for the fourth game in a row for the first time since 2015 when they took a narrow 1-0 win over Crawley Town on Saturday. In a game of little excitement and action, Kieran Agard capitalised on a defensive howler from Crawley skipper Dannie Bulman to score the only goal of the game four minutes before the break. Kieran Agard pokes home the only goal of the game. Other results around them mean Dons remain up with the pack chasing automatic promotion, while moving seven points clear of Exeter in fifth. After providing two goals and two assists from the bench in the last three games, Chuks Aneke returned to the starting line-up for Dons as Paul Tisdale made two changes to the side which started against Newport last week. The other saw Russell Martin return to the centre of defence as Mathieu Baudry's injury-ravaged season ruled him out once again. 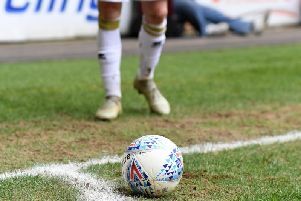 After what was arguably Dons' best performance of the season in the reverse fixture in November where Dons ran out 4-0 winners at Broadfield Stadium, the opening half hour at Stadium MK did not live up to the same billing. While neither side looked on top, it was the visitors who boasted the better chances, with George Francomb's cross crashing against the bar early on as it deceived everyone, while Ollie Palmer should have done better at the near post when he beat Joe Walsh to Lewis Young's cross, rippling the side netting. At the other end, Chuks Aneke had a half chance when he tested keeper Glenn Morris from a tight angle, while Jake Hesketh struggled to make the keeper work. But with half time fast approaching, Dons took the lead courtesy of a shocking bit of defending from the Crawley skipper. As Stuart Moore boomed a ball down field, Dannie Bulman ducked away from the header, thinking Morris would come and collect. But Kieran Agard was on his toes and raced onto the loose ball and rounded the keeper to give Dons the lead. Crawley nearly doubled Dons' advantage 10 minutes into the second period when Joe McNerney looked to play it back to Morris, only to beat his own keeper and, sparing his blushes, the upright as well. Much like the first half though, there was not much to say about the second period. Dons played the lionshare of the game in the Crawley half but the decisive ball never came off. For Crawley, a half chance for Ollie Palmer did not trouble Moore.